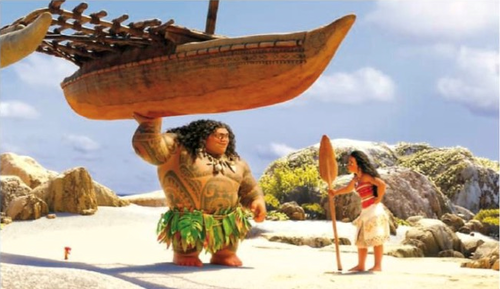 Disney may not make the most culturally authentic movies in the world but they do make the most spiritual ones. And when I say spiritual I do not mean they incorporate religious teachings and beliefs in their work. Most religious people have issues with their movies for this very reason. What they do do (and do well) is create wonderful imagery full of meaning and emotions. 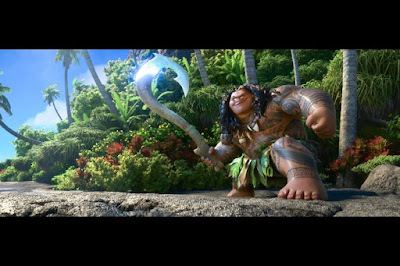 For watching “Moana” may not give you a great idea of what a real Polynesian tribe acts like, but you watch the film immersed in the feelings of the culture and beliefs the film brings to the table. When the title character sings of being called to great things in her life, with the ocean waves surrounding her and spirits of the dead guiding her along her path, you understand the meaning of the journey even if the specifics are difficult to pin down. This is a journey of the heart that happens to take place on the high ocean seas. The ocean, it should be mentioned, also has a lot of personality. 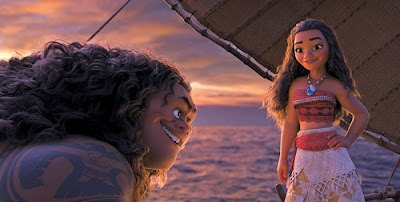 Not only does the camera swing and sway through storms and raging seas, but the water itself seems to help out Moana (Auli’I Cravalho) with not only her general direction in life, but guides her along her path and puts her back on the boat when she is thrown off it by her traveling companion Maui (Dwayne Johnson), a legendary shapeshifting demigod who does great works for humanity (so long as the praises keep coming in). The vast majority of the film is on the water, surrounded by spirits, while two very likable characters play off each other. In most films the two leads would probably be set up to be romantically involved. In a rare twist though, neither of the two show any romantic feelings towards each other nor is there any sexual tension to be found. They are friends. Their friendship is contagious. Their debates on whether to eat a practically brain dead chicken provides many of the films laughs in and of itself. The story revolves around a mystic stone that was removed from its proper place years ago. This single event made the ocean unstable and now darkness spreads far and wide. The stone needs to be put back and Moana might just be the girl to do it. It is a classic Disney setup that is occupied by memorable songs and wonderful animation. The film was directed by Ron Clements and Jon Musker, who previously directed “The Little Mermaid” and “Aladdin.” This marks their first attempt at a computer animated movie, and the results are more spectacular than I could have hoped. This is a beautiful film that shows a great understand for computer animation, 3D, and there are even moments that pay homage to Disney’s classic animation style. 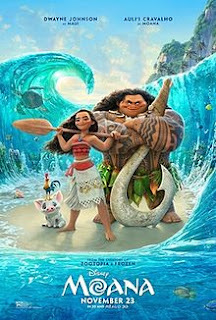 The soundtrack by Lin Manuel Miranda, Opetaia Foa’I, and Mark Mancina is beautiful and catchy, delivering another memorable soundtrack that is likely to have a few breakout hits. If “Moana” stumbles it is only because Disney has been on such a role recently, that there isn’t much higher they can go. It doesn’t scream instant masterpiece like “Frozen” nor does it contain the humanity of “Zootopia.” What it does do is craft a memorable family film that adults can watch even if the kids aren’t with them. It delivers the empowering message for young girls that is sorely missing these days and contains the kind of action that makes boys who like ‘Star Wars’ and superhero movies turn their heads. It is very likely going to become another Disney classic that will be watched again, and again, and again. 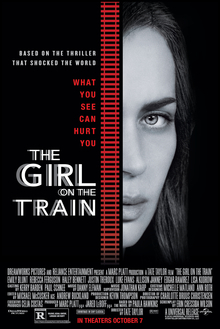 While it is in theaters make sure to see it in 3D on the biggest screen possible. The reason I opened this review talking so much about culture and meaning is because I fear the movie itself could get lost in the conversation about being culturally sensitive. We live in a world where equality and proper representation is high on people’s lists. I’m not saying that is a bad thing, but the best movies are the ones that project ideas in the best possible way. 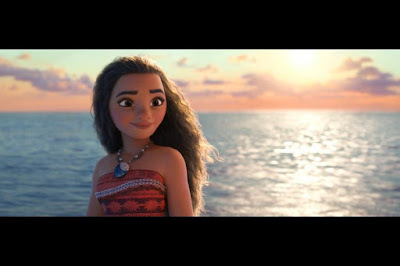 I don’t have the scholarship knowledge to properly assess whether this movie portrays the Polynesian culture respectfully (or even correctly), but as a movie itself the experience is a joy to behold. Already there has been controversy over how the toys are being made. Hopefully people won’t be so focused on that that they end up missing what is, in every other aspect, a great movie. Parents, there is the usual amount of Disney violence. What may surprise most parents is the unusual amount of jokes revolving around urine. Recommended for ages 7 and up.